A fire in an old five-story office building on Ploshchad Tverskoi Zastavy, adjacent to the Belorusskaya metro station in downtown Moscow, sickened two people and trapped 43 others on the roof Wednesday. Ninety-one people were evacuated dramatically from the building by scaling ladders, Interfax reported. Two people were hospitalized with carbon monoxide poisoning. The fire, which took 38 firefighter units to subdue, started at about 10 a.m. and was extinguished at 1:45 p.m., Interfax said. 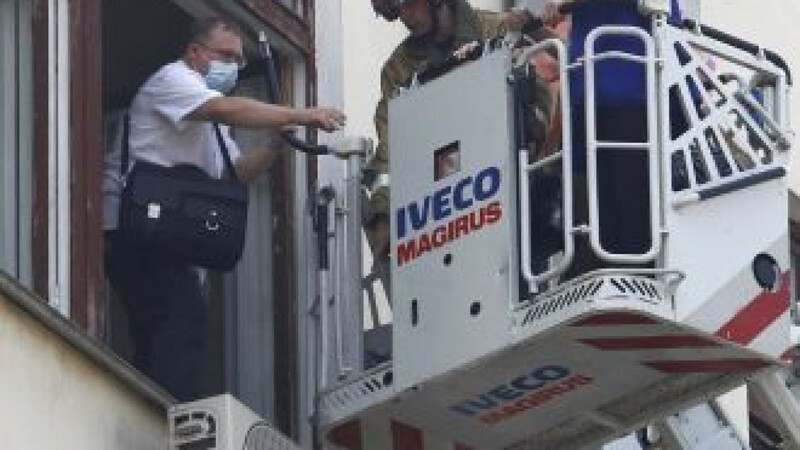 Officials did not comment on the cause of the incident, but witnesses cited by Gazeta.ru said the fire could have started in the computer server room of a medical center on the third floor. Metro officials denied that the fire disrupted operations of the Belorusskaya metro station, but Gazeta.ru said the station's lobby was closed during the incident. Railroad officials said they are unaware of any passengers missing their trains at the nearby Belorussky Station because of the fire. Dozens of passports collected by travel agencies housed in the building might have perished in the fire, Interfax reported.